You'll find a lot of things to do on Catalina Island. Here's our list of the top things to do. Many of these activities require reservations or at least a ticket. Stop at the ticket booth at Crescent and Catalina Streets, and you can reserve them all at once. The first thing you have to do is get there. 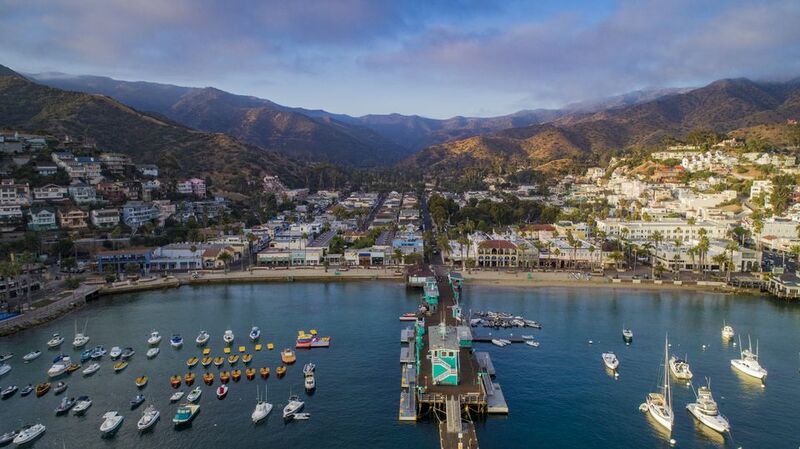 Check out what you need to know about taking a ferry to Catalina. The island is just far enough away from Los Angeles that you might as well make a weekend out of your trip. Just use the Catalina Island Getaway guide to plan your perfect trip. The walk along the waterfront from Casino Point to Lover's Point is my very favorite thing to go when I go to Catalina. Along the way, you'll see orange garibaldi fish swimming in the kelp beds, watch boats in the harbor, pass through the center of town and out again, to where the beaches are less busy and the views unobstructed. Keep going all the way to Pebbly Beach if you have time (and if the road is open). Catalina residents drive golf carts because it's almost impossible to get permission to bring an automobile onto the island, but most visitors do it just for fun. You'll find rental places along the waterfront. While you've got wheels, check the map and head up the hill to take in the vista from just below the Inn on Mt. Ada, run out to the Botanical Garden, then go across town toward the Zane Grey Pueblo and bell tower for a different point of view. Located at the end of Avalon Canyon Road, the Botanical Garden features some excellent specimens of succulents and cactus. The Wrigley Memorial on the hill overlooks Avalon and gives views all the way to the mainland. If you have the energy, you can hike the trail above the memorial all the way to the ridge. Catalina's clear water and abundant marine life make it a favorite for divers and snorkelers. The two most popular spots to go into the water are Casino Point and Lover's Cove. On busy days, you'll find wetsuit rentals and diving supplies for rent at both locations. On Scuba Luv's Sea Trek adventure, you don't need to take diving lessons to enjoy an underwater experience. You can put on one of their specially designed helmets and walk around under the water with just a little training. If you can't swim or dive, you don't have to be stuck looking at the water's surface. Semi-submersible sub tours offer diver-like views. Glass-bottomed boat rides have also been a Catalina tradition for almost a hundred years. Take a night ride with them to see lobsters scuttling along the ocean floor and sharks gliding below. You can rent almost any kind of watercraft from businesses around the harbor, from old-fashioned paddle boats to jet skis and small motor boats. If you'd rather let someone else do the driving, try one of the boat tours offered by the Catalina Island Company. Try one of these ideas for day hikes, from a short ramble around town to a nine-mile walk that's mostly downhill. Serious hikers may enjoy the Trans-Catalina Trail, a 37-mile route which runs the length of the island. Stop by the Catalina Conservancy office at 125 Claressa Avenue for hiking maps and ideas. Hikers and residents with special driving permits can go inland, but for the rest of us, a tour is the only way to get to see Catalina's backcountry. Your tour dollars go toward a good cause if you take the Catalina Conservancy's Eco Jeep Tour and their tour guides are the best-versed about the island's flora and fauna. You can also choose one of the land tours from the Catalina Island Company. Catalina Adventure Tours calls the same trip the Inside Adventure Tour. The Catalina Island Company offers a selection of boat tours that appeal to all interests. You can take a trip in a Ribcraft to search for dolphins, go for the thrills of a jet boat ride, or take a leisurely cruise to Two Harbors at the east end of the island. Catalina's "casino" (the big, white, round-shaped building at the end of the harbor) was never a gambling place, but it does have a beautiful ballroom and movie theater. Take a guided tour or just go to a movie here, arriving early to explore the elegant wood-paneled lobby (appraised at more than $4 million for the wood alone) and enjoy the stylish Catalina history murals inside the auditorium. The fishy little critters really do "fly," speeding toward the water's surface, into the air and every once in a while into a startled visitor's lap. Make a reservation for the boat tour that's designed just to see them, but time it right: their antics only happen on summer nights. Do Nothing! Catalina Island has a way of invoking profound relaxation. Maybe it's the smell of the eucalyptus trees and wild fennel, both relaxing scents according to aromatherapists. Whatever the reason, you may find yourself so chilled out that nothing is the only thing left to do.